MILESTONE® WILDis among the highest-phenolic wild olive oils in the world. It is a unique blend with the rarest olive variety Olea europaea sylvestris. Two master millstones, spinning at eight rotations per minute, softly and slowly press on the wild olive fruit. The finest cut is collected during a long-lasting natural separation ritual. Wild olive oil has been long known for its prevention & healing properties. Modern scientific evidence show that the beneficial effect is obtained with a daily intake of 20gr and within a healthy and balanced diet and nutrition. It is advised to consume it every morning on an empty stomach. As an anti-oxidant and natural food supplement, consider adding it to your food raw so that its antioxidant qualities are preserved. You will experience a wild taste with profound anti-oxidant strength. It is highly dense and buttery accompanied by highly complex aromas and flavors. 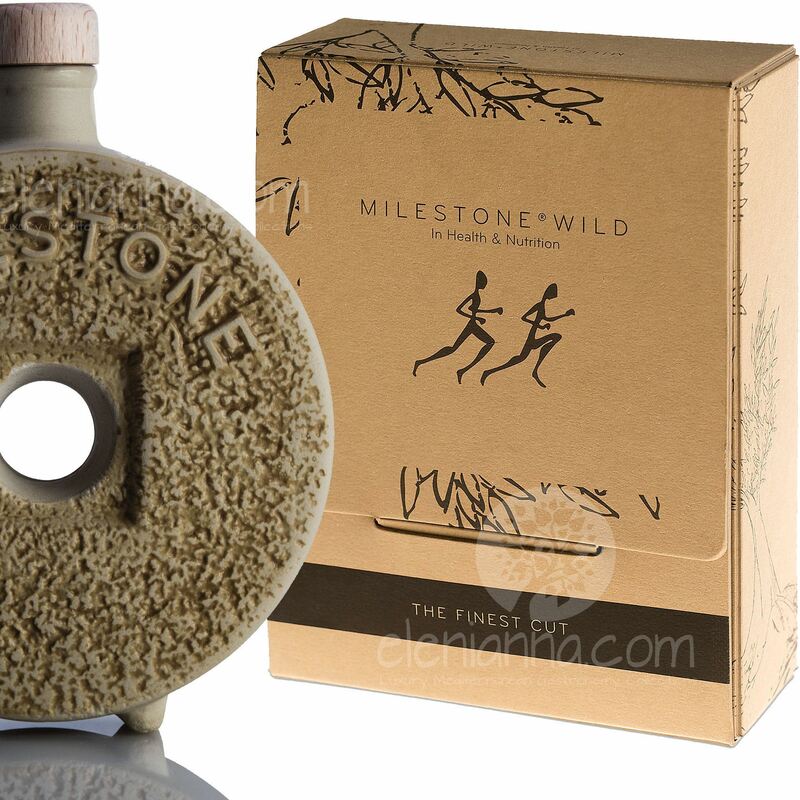 The choice of clay and cork for the MILESTONE® WILD packaging completes the circle of creation of a completely natural and organic product. Every stage of the process is done by hand, thus making every MILESTONE® WILD bottle unique, using materials that are recyclable and environmentally friendly. The daily consumption of 20 gr of the analyzed olive oil sample provides at least 5 mg of hydroxytyrosol, tyrosol or their derivatives (>5 mg) and consequently the oil belongs to the category of oils that protect the blood lipids from oxidative stress according to the Regulation 432/2012 of the European Union. It should be noted that oleocanthal and oleacein present important biological activity and they have been related with anti-inflammatory, antioxidant, cardioprotective and neuroprotective activity.